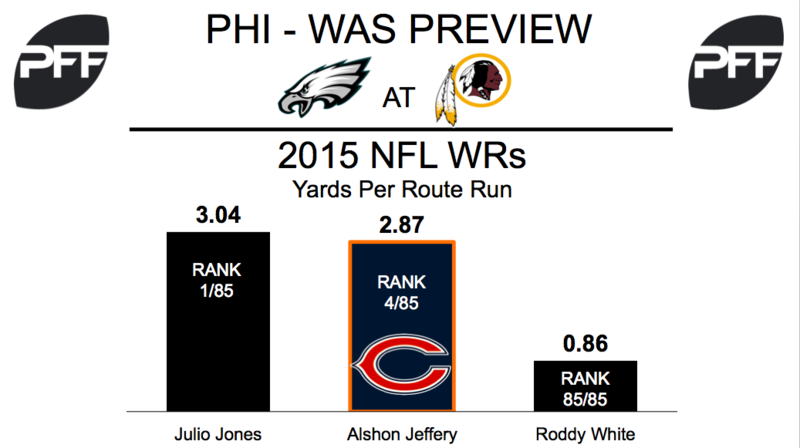 Alshon Jeffery vs Josh Norman – Jeffery will make his Eagles debut against the Redskins, and will be a key factor in quarterback Carson Wentz improving on his rookie season. The wide receiver averaged 1.87 yards per route run last season (43rd at his position), which was exactly one full yard lower than his 2015 average (2.87, fourth best). Philadelphia expects Norman to shadow Jeffery in Week 1, presenting a tough test for their top receiver. New Washington defensive coordinator Greg Manusky was the defensive boss in Indianapolis two years ago when CB Vontae Davis would shadow opposing top receivers. Norman’s 13.5 coverage snaps per reception was fifth best among cornerbacks in 2016. Opposing quarterbacks had a 74.3 passer rating when covering the Washington defensive back. Lane Johnson vs Ryan Kerrigan – Kerrigan is Washington’s top edge defender (81.8 overall grade), rushing primarily from the left side in 2016 (89.5% of rushes). This means his main combatant will be Eagles right tackle Lane Johnson. Kerrigan totalled 72 pressures last season, including 11 sacks, earning a 12.8 pass rush productivity grade (fourth best at his position). Johnson started just six games in 2016 due to his substance abuse suspension, but his 97.2 pass blocking efficiency was fifth highest among tackles. The offensive tackle allowed just one sack in 221 pass block snaps. LeGarrette Blount vs Zach Brown – despite Blount’s underwhelming preseason (2.8 YPC on 13 rushes), his role in the Eagles’ offense is vital. With the Patriots in 2016, Blount forced 42 missed tackles on rushes (eight most among running backs), averaging 2.48 yards after contact per attempt. Brown was signed from the Bills this offseason after accumulating the second-most tackles in the league in 2016. The linebacker accumulated 35 stops in run defense, missing five tackles. His 17.4 tackling efficiency ranked 13th at his position last year. 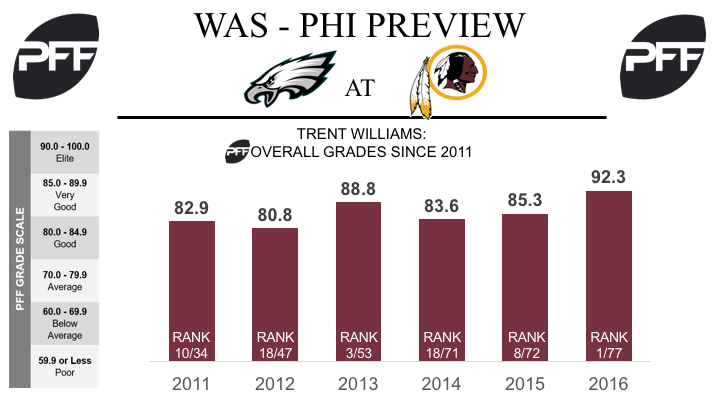 Trent Williams vs. Derek Barnett – In 2016, Williams’ PFF overall grade of 92.3 was not only the highest of his career, but the fourth highest grade ever recorded by a tackle in the PFF era. His performance in pass protection remained solid, and he allowed just 16 quarterback pressures on his 475 pass blocking snaps, the league’s third-best mark. In the regular season opener, Williams will have his hands full with rookie defensive end Derek Barnett, who dominated his competition during preseason. Barnett played 48 pass rushing snaps this preseason, produced 11 total pressures, and ranked fourth among the league’s 4-3 defensive ends with a pass-rush productivity of 18.8. Rob Kelley vs. Fletcher Cox – The 2016 season saw rookie running back Rob Kelley emerge as one of the most elusive runners in the NFL, so he’ll be looking to carry that over to his sophomore year. In 2016, He forced a total of 39 missed tackles on 180 total attempts, and ranked fourth among 53 qualifying running backs with an elusive rating of 61.5. On Sunday, he’ll no doubt come up against interior lineman Fletcher Cox, who was produced 19 stops on 273 run defense snaps last season, and ended the campaign with a run defense grade of 85.4. Terrelle Pryor vs. Ronald Darby – In his first regular season start in a Washington uniform, Terrelle Pryor will need to bounce back from his underwhelming preseason performances. Through three preseason games, Pryor dropped two of his four catchable targets, and managed a PFF overall grade of just 45.6. However, he’ll get the chance to redeem himself against Eagles cornerback Ronald Darby, who allowed a passer rating of 104.8 on throws into his primary coverage and an average of 1.63 yards per cover snap last season, ranking 93rd and 100th of 117 cornerbacks, respectively.